ESS Protective Eyewear Technology will be Standard Issue Item, ESS Remains the Authorized Eyewear Provider to the USMC with its trio of authorized, Standard Issue products: the Crossbow anti-fog military eyeshield, the Profile NVG Goggle, and the U-Rx prescription insert. ESS (Eye Safety Systems, Inc.) today announced that its Crossbow™ ballistic spectacle has been selected as the standard issue eyewear authorized for use by the United States Marine Corps. All Marines will receive a new set of Crossbow™ spectacles in a total force resupply commencing in 2011 and continuing throughout 2012. The Crossbow™ is part of a complete eye protection system from ESS that includes the Profile NVG™ goggle and the U-Rx™ prescription insert. 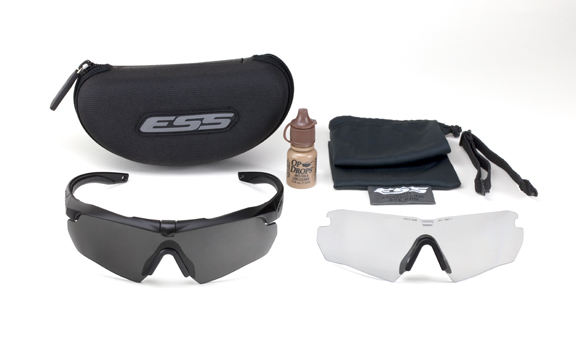 These three ESS products now represent the only standard issue authorized eye protection for U.S. Marines. As the world’s leading manufacturer of military eye protection, ESS has the ability to support the significant production volume required to fulfill the USMC’s ballistic eye protection needs. ESS will produce the eye protection needed to outfit the Marines while continuing to meet the very high demand for the Crossbow™ from the U.S. Army, Navy, and Air Force. Having earned a listing on the elite U.S. Army APEL (Authorized Protective Eyewear List) in 2010, the Crossbow’s popularity is still on the rise amongst military and tactical customers and has now expanded to other eye protection users - including hunters and shooters - who appreciate the many benefits of this high-performance military product. The Crossbow™ spectacle system is compliant with U.S. MIL-PRF-31013 (Clause 3.1.1.1), U.S. Federal OSHA, ANSI Z87.1 2010 Edition and CE EN 166. All Crossbow™ lenses provide 100% UVA/UVB protection. Visit http://www.esseyepro.com/crossbow for further details. ABOUT ESS: Established in 1998, ESS (Eye Safety Systems, Inc) creates advanced eye protection systems for military, law enforcement, and fire/rescue professionals. Designed for the planet’s most hostile and unforgiving environments, ESS products feature cutting-edge technologies and patented innovations to ensure peak performance and uncompromised eye safety. Headquartered in Sun Valley, Idaho, ESS is a wholly-owned subsidiary of Oakley, Inc. ESS eye pro is manufactured in Foothill Ranch, California, and is sold in over 100 countries. For more information, please visit http://www.esseyepro.com.